There are some movies so cool that they can exist only as trailers. While trawling the depths of the internets, I ran into a bunch of them - well collected & catalogued. Here are a few interesting clips from collegehumor.com. First up is an epic tale of a young man's struggle against the burdens of his conscience. Of someone who's entire life is about not getting blown up. Experience the safety of being a minesweeper, with all the danger of playing it on your own computer in - The Minesweeper Movie. If you are more into crime thrillers, rather than the war kind, you might enjoy Facebook / Off. An excellent combination of the classic Face/Off with online identity theft. As you might have guessed, this won't end well. And for those of us who grew up playing "Where in the World is Carmen Santiago?" (smuggled into school on multiple floppies), here's a Quentin Tarantino-esque adaptation, aptly titled Where the F*ck is Carmen Santiago. After all, you'd have a tough time finding out even with the help of google maps. 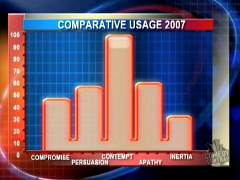 Well, this statistical anomaly is from the Daily Show, as presented by the special correspondent Aasif Mandvi. Somewhat in the same lines as most environmental conservation ads - hopefully the comedy central web-player works for you. It didn't for me - but I found a workable workaround (so to speak). Apparently, youtube isn't the only place to waste time on the intarweb.